One morning last fall I woke up with a craving for a donut only Homer Simpson would understand! Consulting the World Wide Web, I quickly surmised donuts clearly take second place to kringle around these parts of the Midwest. Now nothing against the official state pastry, but nothing can satisfy a donut craving like an apple fritter, bear claw, or enough custard filling to keep cardiologists in their luxury sports cars. Lane's Bakery & Coffee has been an original Madison donut destination long before we moved to town. Taking a few year's hiatus to regroup and move down a few miles further south on Park Street, the new location is clean with ample parking and plenty of room to dine in. 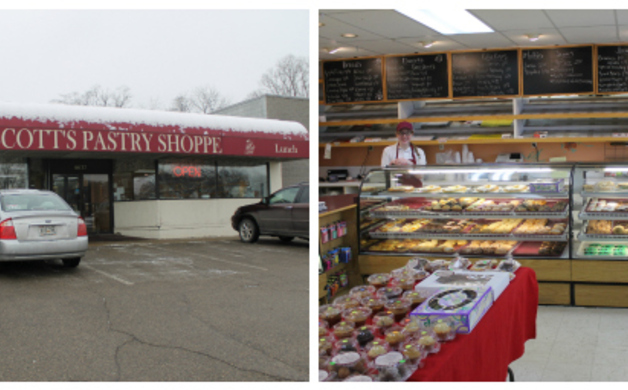 Lane's offers donuts, cakes, and kringle and whip cream cakes located in the freezer case along the back wall. You can also order a light lunch from the soup and sandwich menu. 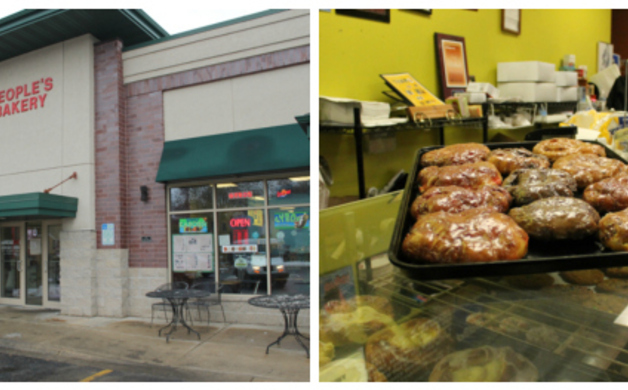 In the same location as what used to be "Go Nuts for Donuts," the People's Bakery has kept up the donut business in addition to serving up some of the best Mediterranean and Lebanese food around. 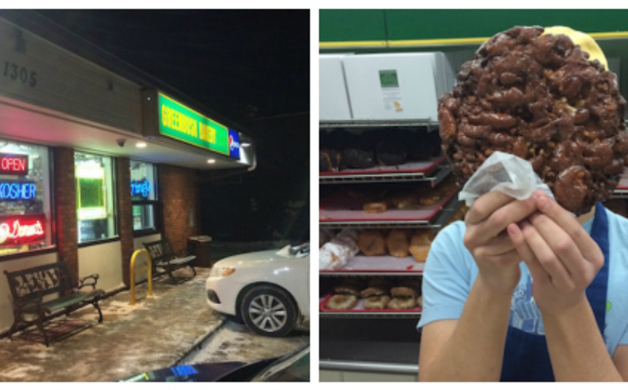 Made fresh starting at midnight, the owners of People's Bakery assured me their donuts are never frozen. Fritters come in blueberry, cherry, cranberry, apple, chocolate, and banana (Who knew there were so many choices?). As you might expect, People's Bakery also carries baklava in the dessert case. You'll also find a small dining room here. Madison resident Dan Jacobsohn (aka: IT professional by day and donut connoisseur by night and weekend) will tell you Greenbush Donuts make the best donuts in town. Greenbush Donuts are kosher and the fritters are literally the size of your head. Dan took me to Greenbush on a cold Friday night in the peak of the Polar Vortex and there was a line forming out the door. There's no space to eat here; you'll have to take your donuts to go. Another Dan Jacobsohn find is Rosie's Coffee Bar and Bakery in Monona. The store opened in 2014 and I wrote a print newspaper review here (complete with background history, quotes, and a bit more on what to expect at the top-notch coffee bar). 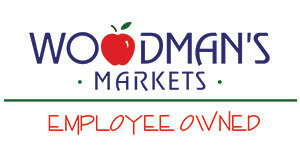 I, personally, like the donuts made with alcohol as a key ingredient (not to mention the prices are the best around). 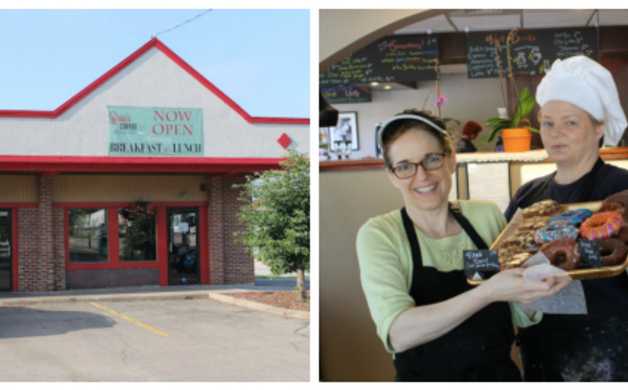 Try Rosie's donuts and you'll be back for lunch. After receiving the feedback I missed Scott's Pastry Shoppe, I hauled myself out to Middleton to see what the fuss was all about. On par with the venues listed above, I felt that while Scott's did not have one particularly donut that stood out it overcompensated in volume and variety. If you aren't in the mood for a donut, try a donut, cupcake, or cutout cookie. There's ample room to stay and read the paper at this location and if you find a spot towards the back corner, you can watch the action in the kitchen and decoration stations. Also worth mentioning is the small donut selection at Monty's Blue Plate diner (I think they taste a bit chewey, but to each his own.) on Atwood Avenue and the wide-range of non-donut pastries at Batch Bakehouse just up Willy Street. Rumor has it there's a fabulous donut shop somewhere in Stoughton and we've frequented a diner/pastry shop on the main drag in downtown Mount Horeb. Again, if you have a recommendation or somewhere we should try, please leave a comment below.